Welcome to my favorite Law of Attraction resources! I am regularly asked about different free tools, training, and resources available to learn the Law of Attraction. People particularly want to know what I use to have success with the Law of Attraction. 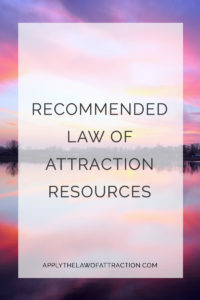 As a result I've put together a list of Recommended Law of Attraction Resources – all 100% free – that I personally use. No exceptions! I will add to this list as I come across new free Law of Attraction resources that I recommend. Abraham Hicks has a few free articles under their journal section. Mind Movies – Get 6 free mind movies (digital vision boards) on love, money and more. This is the program that helped me manifest a trip to Ireland in less than 30 days! Feeling is the Secret – Neville Goddard is one of the best known teachers of the Law of Attraction. He spent his life teaching people how to visualize properly. This site allows you to read his works. I hope you enjoy these recommended Law of Attraction resources. They show that free resources can produce powerful changes in your life…without costing you a penny.